As you know, all wooden structures is a serious drawback. Over time, the bottom row of logs (lower crown) subject to decay, which leads to the destruction of the house. In this situation the only correct solution is a partial or complete replacement of rotten logs. Pick up a new log. It must exactly match rotten log. Don't forget ostrogat a new beam, so that it is tight against the lining. In order to avoid new trouble with rotting wood, the lining lay 2-3 layers of waterproofing material, pre-cut into strips. On top of the logs will get konopatochny material, then you can gently lift up a log with wedges. After installation, immediately proceed to rebuild the Foundation. Complete replacement of the crown can be carried out without lifting and home lift. In the first case, rotten logs are extracted by a method similar to the previous one. The difference is that further cut down the gusset of both logs, with the two sides, after which old log can be removed and replaced. If you don't want to touch the Foundation, then the house will have to raise by means of jacks to a height of logs with the stock about 10 cm Before installing the Jack, determine the status of the log. If it is severely damaged, then it follow 2 sockets to install jacks. When lifting the first of the logs you raise and the second is placed under them in wedges or logs. Then remove the jacks and free up space for new logs. After replacement go to the opposite side. 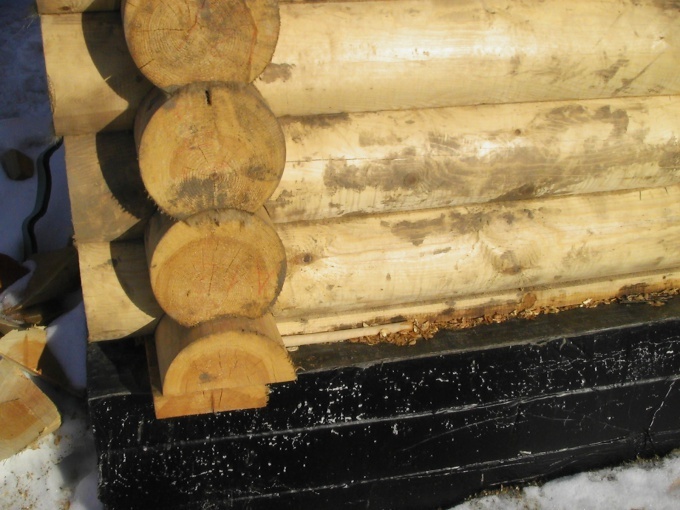 The second logs are replaced similarly, with the difference that the Jack is put under the third log following the wedding.